Posted on Thu, Feb 16, 2012 : 5:30 a.m.
Two weeks in a row without anyone beating me ... I got cocky. Like an animal with no natural predators in its environment, I became fat, slow and lazy. I was vulnerable to the neighborhood dog of the informed reader and the passing car of knowledge. And now I stand before you, the roadkill of prognosticators. OK, that's a little extreme, but I was brought back down to earth last week with a 5-3 performance. To borrow my least-favorite cliche in the sports book, it was a humbling experience. Congratulations to Sami Shalabi of Ypsilanti, who won the $20 Domino’s Pizza gift card. Sami also happened to be one of the 13 whose picks were better than mine this week. Might want to go out and buy a lottery ticket this week, Sami. For all but two games over five days in the first week of January this season, the Manchester High School girls basketball team has been perfect. 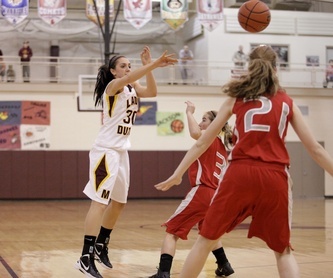 McKenna Erkfritz, left, leads Manchester with 16.7 points per game. The Flying Dutch won their first seven games before that week, and have won the nine since. But it is those losses that hang over their heads, 46-45 to Michigan Center on Jan. 6, and 61-57 to Grass Lake on Jan. 10. In both games, Manchester led heading into the fourth quarter, but let the game slip away and it's been on the players' minds ever since. "After those two losses especially to Michigan Center, it was a reality check," said Taylor Manders, who is averaging 12.3 points for Manchester. "We have to go out like this is our last game." In order to accomplish the goal of winning a Cascades Conference championship, the Flying Dutch needed more than to just to win its rematches. They needed some help. That help came in the form of a 51-47 Napoleon win over Grass Lake two weeks ago, Grass Lake's first league loss of the season. Michigan Center, meanwhile, is 7-5 in Cascades play and has fallen out of the race. With its two remaining regular season games against Michigan Center and Grass Lake, Manchester is once again in control of its own destiny in its pursuit of a league title. First up will be Michigan Center on the road, which will lead off our picks this week. It's a Thursday night tipoff, so remember to get your picks in early! People who have "Beat Pete" so far: 46. Thu, Feb 16, 2012 : 3:32 p.m. The Milan boys basketball team will be at home against Monroe St. Mary on Friday, not away as was originally reported. The correction has been made, please do not drive to Monroe.